Boiled-down, illustrated, and on a poster! It’s a modern cliché, an obnoxious first-world problem: Explaining your new-fangled job to the person sitting next to you on an airplane. Once, I was a graphic designer — that was easy to explain. I rarely flew anyway. 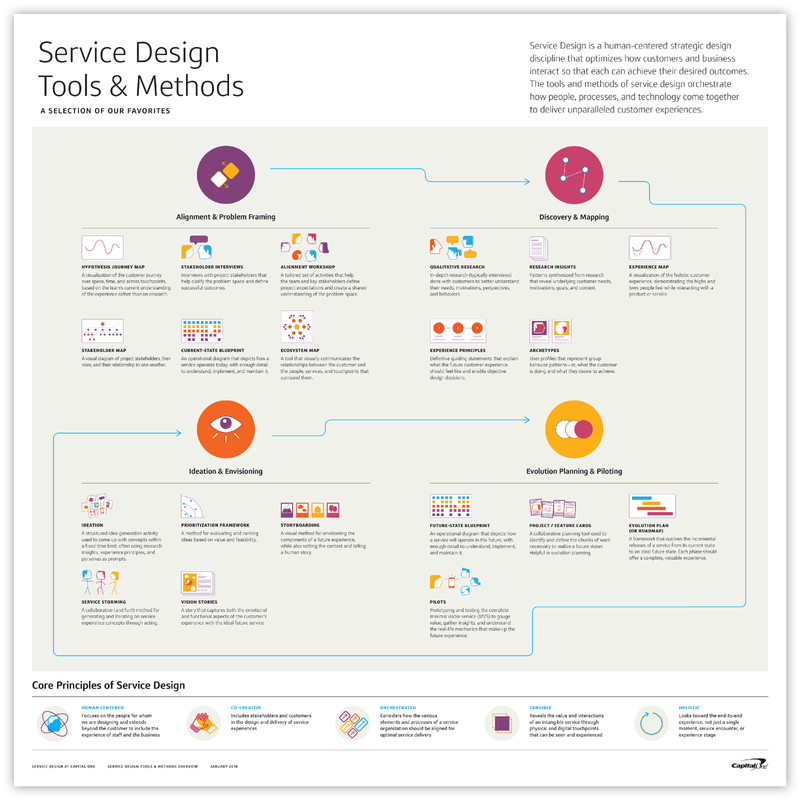 In the last five years, I’ve been on lots more airplanes and have explained “Service Design” on a number of them. Doing it clearly and succinctly was not always so easy, but I’ve been practicing in a variety of contexts. For strangers on planes who wanted something short & snappy, for workshop attendees who paid for the long version, for colleagues in business and technology who wanted to know if it was something they could use. The growing awareness of human-centered design, design thinking, etc., made this task both easier and harder all around. In the past year, I’ve been part of a small team at Capital One focused on scaling service design know-how within the organization. We’ve done this through trainings, and we’ve also created toolkits and guides (building on this guide to experience mapping and this guide to service blueprinting) for people who want to bring these methods into their own work. We’re excited to share this poster, which outlines our approach to projects by design phase. Each phase includes our go-to activities with brief descriptions. It’s a zoomed-out, visual look at not only the tools & methods, but how we might approach a service design project. Download the poster here, or check out our mobile-friendly version here. What’s so exciting about this? In introducing key methods of service design, we sometimes found that people confused the parts with the whole. Service blueprinting, for example, is a useful, versatile tool, but there’s more to service design—lots more. We’ve visualized that here. By taking the focus off any specific method, we can at least suggest the importance of context and a holistic approach. By grouping the tools & methods into descriptively-named phases, we can help people start to get a sense of how and when they’re most useful. It’s hard to communicate without some sort of shared language. This poster is part of a larger body of work that aims to do that within Capital One. We don’t claim to have created the definitive guide (pretty sure there isn’t one). This represents a good selection of favorites from our practice, but is not exhaustive. It will surely require updates as the practice of service design evolves. With that caveat out of the way — please help yourself to your very own PDF copy. If you yourself could use some help explaining service design, or really any type of design strategy process, you can just print this out, hang it up, and point at it. Enjoy! Check out ONE Design’s open positions here.